Steve Edwards is best known for his large London cityscapes. 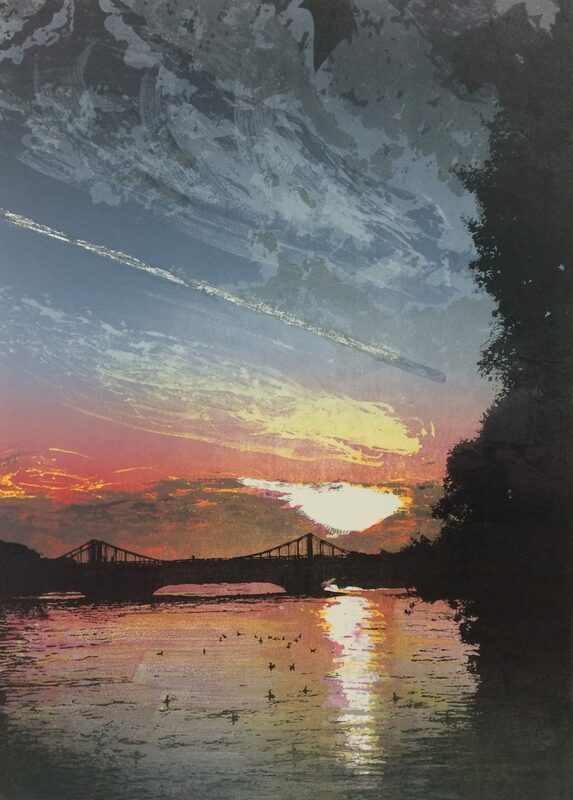 His original prints combine processes including linocut, lino etching and monotype, and as a result are hard to pin down; they have a crisp photographic quality that hits you on first glance, but take a closer look and you see textures, marks and intriguing colour that give his work mesmerising depth. 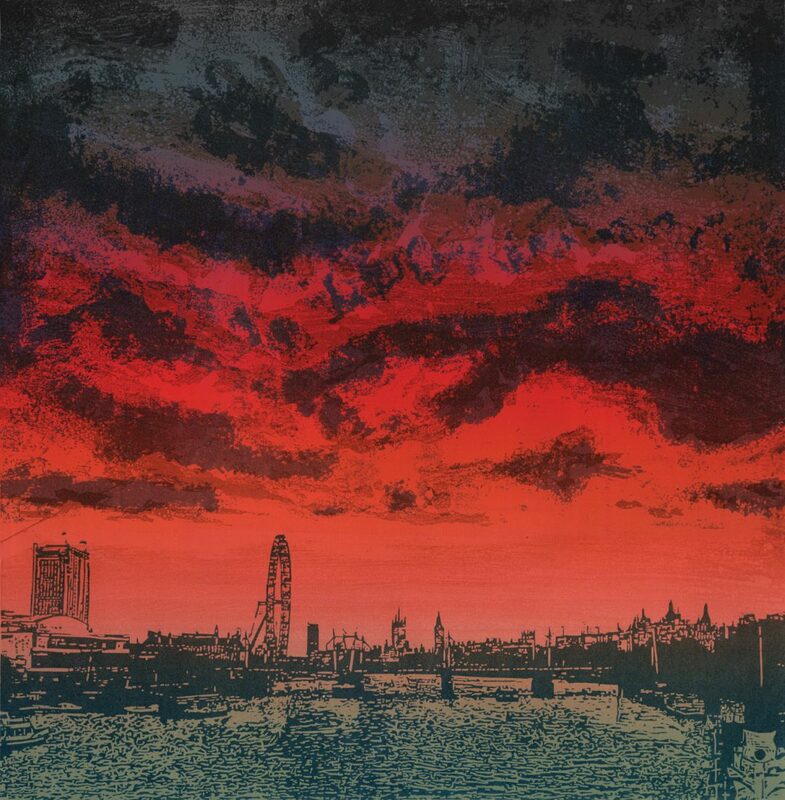 Steve uses Lino etching (the process of using a caustic soda solution to etch into lino) and monotype to add painterly, expressive marks to his moody skies, while the crisp edges of silhouetted buildings are created using traditional linocut. 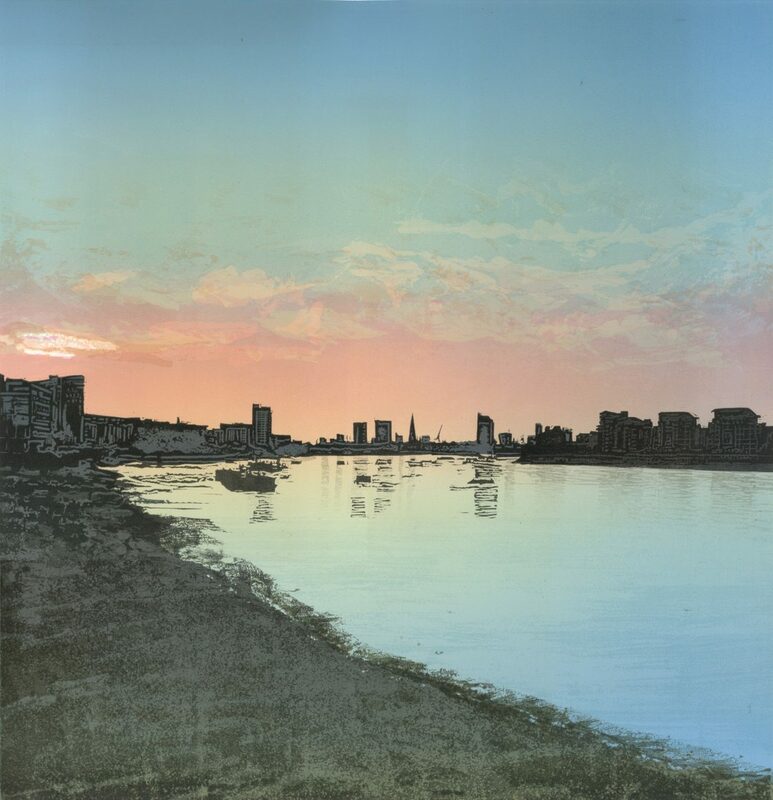 Steve Edwards recently won the Jackson’s Visitor’s Choice Award at the National Original Print Exhibition for his print ‘Lambeth West’. Having long admired his work, I was intrigued to find out more about how Steve Edwards approaches his work. Lisa: Can you tell us a bit about your way into printmaking? You say on your website that you first had a taste of it when studying a Textile Design course at Camberwell in the 80s, then picked it up again in 1998 at City Lit. what happened in the intervening years? Steve: The years between I was creating images on cloth, large hangings for walls initially which eventually scaled down to paintings. Then I stopped doing anything as I got a full time job, which took up a lot of time and energy! But eventually the lure of printmaking pulled me back and I went to City Lit. Once I had completed a taster course I became hooked on etching, which I practiced until 2005 until lino won me over, mainly because of its strong relationship with colour. 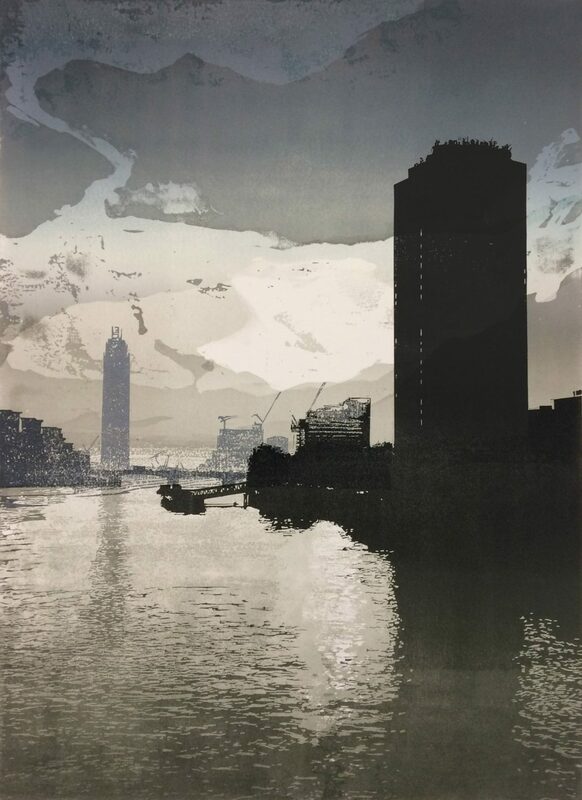 Lisa: You often combine linocut with lino etching, and there’s a lovely contrast between the austere, crisp lines of silhouetted buildings and the soft painterly, shimmering effects you achieve when inking up lino etching. How did you first discover lino etching and is it really as dangerous as printmaking technicians would have us believe? 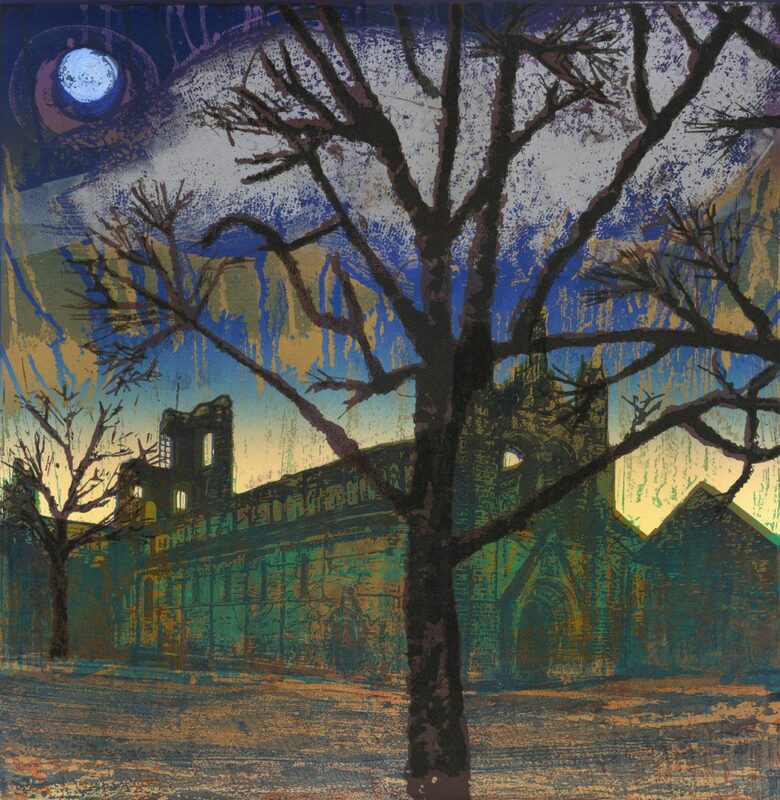 Steve: I first became aware of etching lino with caustic soda at Morley College, which I attended after City Lit. I was given a handout about lino in general which included a recipe for the caustic solution and some timings and examples. At the time I was very much an etcher but someone at Morley was practicing etched lino and I saw her work. Years later when I had begun my lino phase I dug out the info sheet, saw the recipe and decided to experiment. As I had been etching for years before I suppose the ‘language’ of it spoke to me and I have continued combining the cut and etched marks ever since. Because I had been introduced to the idea at Morley, which is a bastion of printmaking, I trusted that the lino etching process was no more dangerous than other chemical techniques used in printmaking. As with any process, as long as you are sensible, aware of what you are doing and in a suitable environment with suitable protective equipment, it is safe. Lisa: I’ve met printmakers who see the concept of reproducing an image to create an edition of prints as a major attraction to the medium, while others are drawn to the opposite – that it’s easy to create as many different images as you like in a relatively short space of time, with each impression altering colours, layers, marks….in which camp do you fall? Steve: Somewhere in between! I love the idea of planning a multi-block lino print from a photograph I have taken of a view that has captured my attention and imagination. The final print needs to evoke that particular place, time of day, time of year, atmosphere etc… yet because I use a lot of colour blends in my work, and I print the variable edition in batches, then there are always variants in each print which I also like. Therefore I mark my prints as variable editions. Once a year I participate in a Box Set at East London Printmakers, which has to be an edition of usually 40 identical prints, which I do also enjoy. Lisa: Can you talk us through what it took to create ‘Lambeth West’ – how much preparatory drawing was done, how many blocks you worked on to create the image, and how you selected your colours? 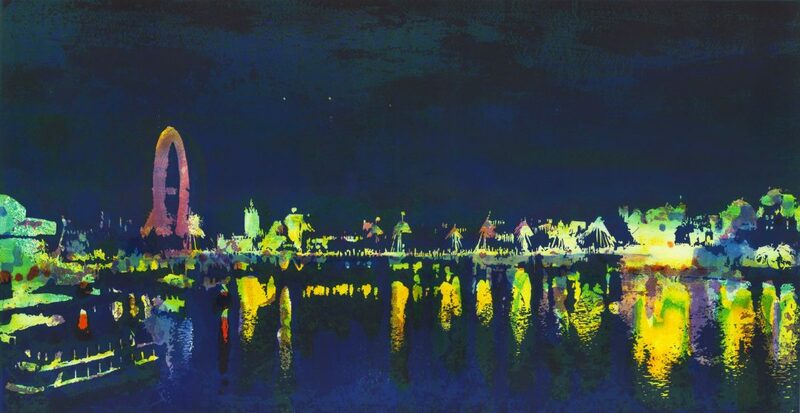 Steve: I base all my landscapes on photographs I have taken over my many years of living in London. I cycle mostly to get around and I like to be able to stop quite easily as I am going over a bridge or anywhere and capture a particular moment that I find beautiful or dramatic. Some photographs I know immediately are going to end up as prints. I breakdown the image in my head into layers which I transfer onto lino blocks which I cut and/or etch to create the situation and atmosphere I am aiming for. 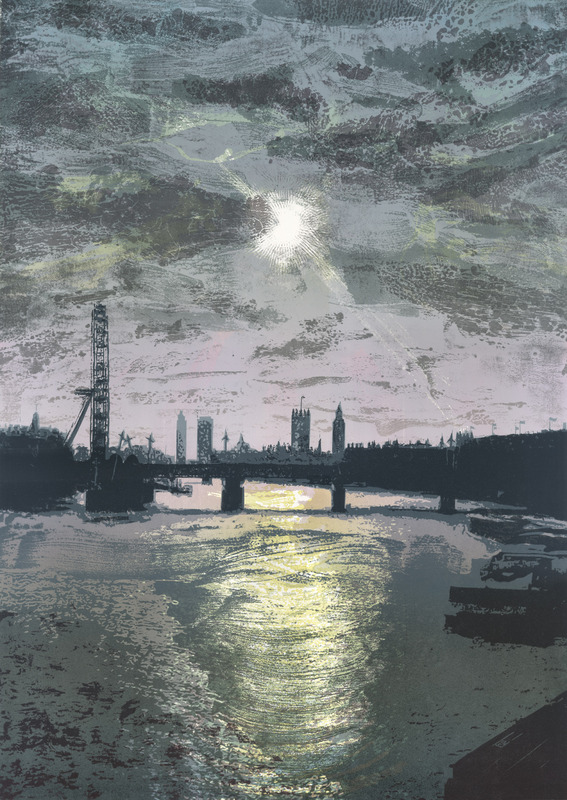 ‘Lambeth – West’ was a moment in February walking over Lambeth bridge and seeing this extraordinary combination of city and atmospheric sky and light which I wanted to translate into print. The colours are initially there in the photograph, but the layering of inks and transparencies informs the palette. ‘Lambeth – West’ is created from 5 individual lino blocks. Lisa: Where do you make your prints? 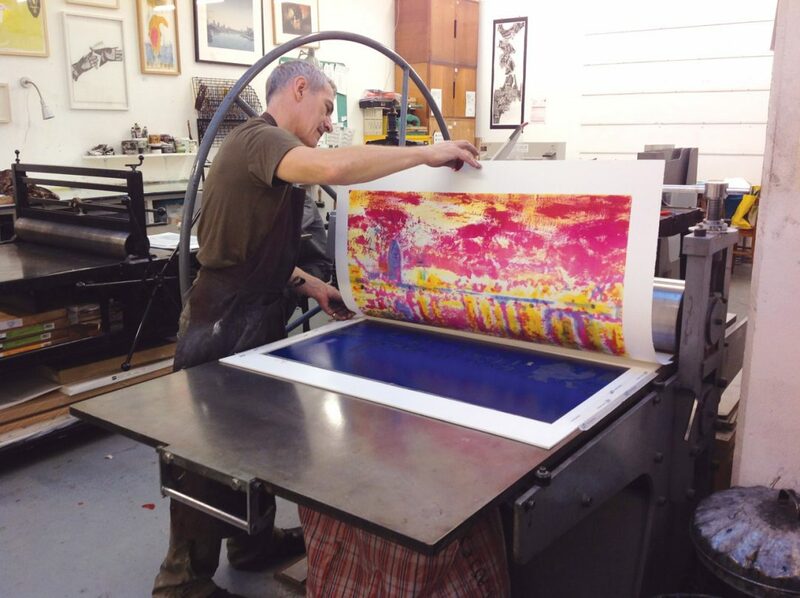 Steve: I print at East London Printmakers in Mile End. I have been a member since 2004 and it is a fantastic co-operative print studio run by its keyholders. Lisa: Can you tell us what your favourite paper and inks to work with are? Steve: Paper is Somerset satin 300gsm and inks are T N Lawrence linseed oil based relief inks. Lisa: How important is being selected for exhibitions and winning awards to your practice? Steve: I am happy and proud to be selected for exhibitions, as I want people to engage with my work. The Jackson’s Visitors Choice is the first prize I have been awarded and I am thrilled that people liked my work and voted for it. Lisa: What would be your advice to someone who likes the look of linocut printmaking but is apprehensive about giving it a go? What’s the best way to start exploring the medium? Steve: When asked, a lot of people say that their first experience of lino cutting was at school, which was mine also. As with most things the actual doing is crucial. Just take the plunge and sign up for a course. We are lucky to have many great workshops and colleges in London with courses for beginners and other levels. Hopefully the experience of carving, inking and printing will be enough to make you want to carry on and develop your practice. I believe that many art activities and beneficial for the mind and body. I teach my particular method of etching lino and combining it with cut marks on multiple plates at several studios, including East London Printmakers. 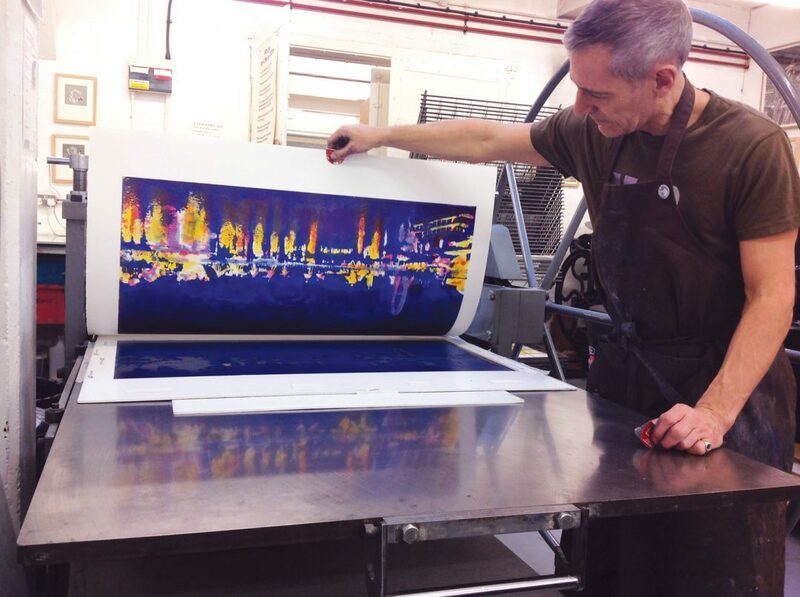 Steve: My latest print is a view of Chelsea Bridge at sunset developed from a photograph I took 2 years ago. My aim is to depict views either of or from all the bridges in London, capturing the location and a particular mood created by the light and atmosphere. 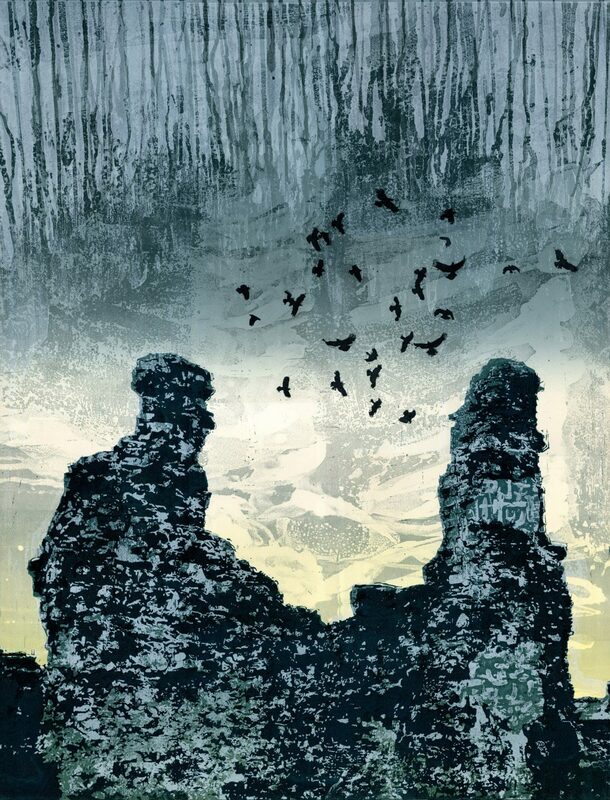 Over the years I have also been working on a series of ruined abbey prints along with a parliament of owls. Steve: You can visit my website steveedwardsart.com to see my work. The website also has an exhibitions page for upcoming shows I am participating in, and a page that shows the workshops I am teaching. I also have work available on the Print Solo website. 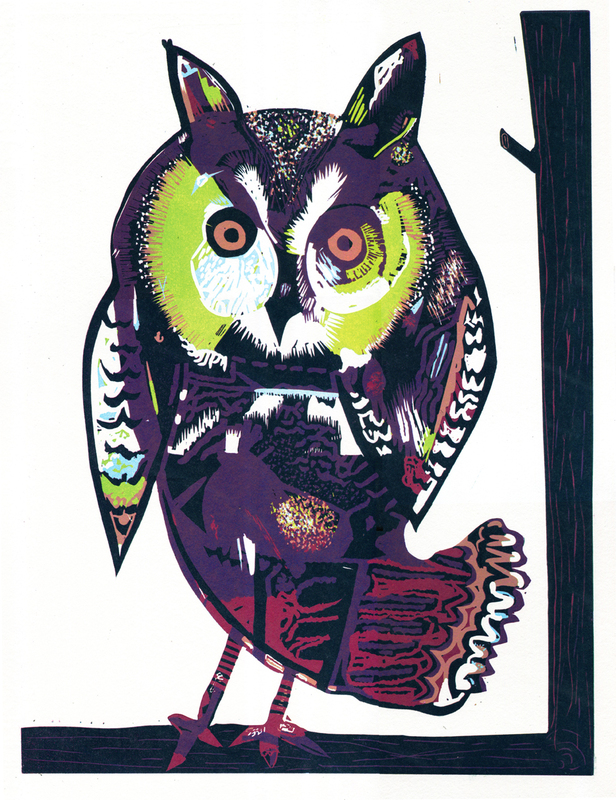 I am a member of Greenwich Printmakers where you can see my work and also For Arts Sake in Ealing. I think that seeing work “in the flesh” is always best as the scale is difficult to fathom when you look online.